Just before Thanksgiving, my friend Marisa invited me to be a return guest on her podcast, Get Well, Girl. The topic? Gratitude, of course! Here's a sneak peek at (& an expansion of) some of the content of our conversation - five ways I try to practice the act of gratitude. Listen to the podcast to learn more about how & why - plus a few funny stories from Thanksgivings past. 1. Naming three good things. Sometimes at the end of the day, when Mike & I are lying in bed, I'll ask him to name three of the best things about his day. It's a nice, low-pressure way for us to reflect on the day behind us & to identify specific moments or experiences that we're thankful for. While it's a fun exercise to do on good days, it's an especially meaningful one on bad days, when it can be difficult to see the positive. It's always there, if you take the time to look! I purchased a daily gratitude journal on Amazon, & though I've unfortunately since left it in a hotel room, I'm planning to repurchase. 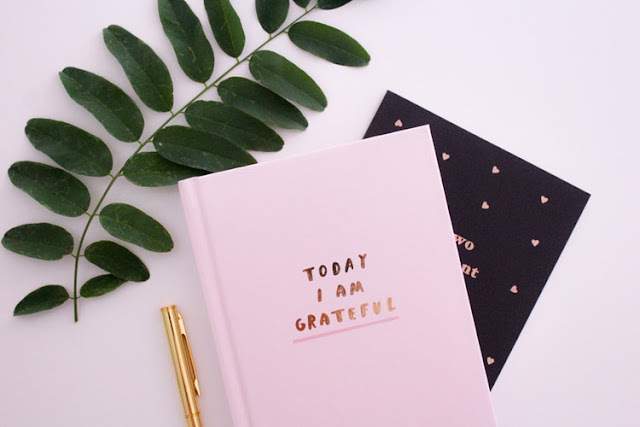 I love the idea of practicing gratitude both first thing in the morning & last thing at night, following simple journal prompts designed to help me identify my hopes for each day & the best parts of the day behind me. 3. Saying " Thank you." A coworker once told me that I was the only person he worked with who regularly said "thank you." How is that possible? Now, I make it a point to respond to work emails with a simple "thank-you"; it can be all too easy to neglect to do so, but it's so important. We may not think of thank-yous as acts of gratitude, but that's exactly what they are: outward expressions of our thankfulness to & gratitude for others. Don't underestimate the power of how good you can make someone else feel just by recognizing them & appreciating them. I'm a big fan of snail-mail notes. Remember this piece I wrote for Country Living magazine? I sent thank-you notes for just about everything, from friends hosting us for dinner to gifts from my mother - but I also love writing simple snail-mail notes of hello, those old-fashioned letters to friends that are all too frequently replaced, these days, by one-off text messages. Sending a snail-mail note says, "I am thinking about you & I care about you & I am grateful for you." Plus, what's better than getting actual mail amidst all the junk mail?! Whenever I have a good experience at a store of restaurant, am on the receiving end of stellar customer service, or purchase a products I love - especially from small & locally owned businesses - I try to show my gratitude to them in the form of writing a public review. A positive rating & review on Yelp or Google can go a long way to a business that doesn't have the power of its own marketing team. Want to hear more from Marisa & me on the topic of gratitude? Give us a listen! You can download the new episode of her podcast, Get Well, Girl, on iTunes or wherever you get your podcast fix.